Arian Isa Foster (born August 24, 1986) is a former American football running back. He played college football at the University of Tennessee, and was signed by the Houston Texans of the National Football League (NFL) as an undrafted free agent in 2009. Foster was known for his signature Namaste bow, which he frequently performed after scoring touchdowns. Foster holds the Texans franchise records for rushing yards and rushing touchdowns, and also played for the Miami Dolphins. Foster announced his retirement on October 24, 2016. Foster was born August 24, 1986, in Albuquerque, New Mexico, to Carl Foster, a former wide receiver for the University of New Mexico, and Bernadette Sizemore, a secretary for the university. Foster's father signed with the Denver Broncos in 1982, though was not able to make it through the summer, and never actually made it to the NFL. Foster has four siblings, Abdul, who was also an athlete, running track in high school and in college at Florida A&M, and Christina, who received her Masters at SIT in Vermont, his brother Braxton and sister Maria. Foster's mother encouraged him to play football at the age of 7, to the dismay of Foster's father, an ex-wide receiver himself. As a former player at a high level, Carl was not supportive of the idea of his son entering the sport at such a young age. Foster took to the game, telling his elementary school teacher that he intended to become "a star in the NFL." Foster attended Taft Middle School in Albuquerque. His parents divorced in 2000 while he was attending Valley High School in Albuquerque, and in 2002, he moved to San Diego with his father. Foster competed in football at Mission Bay Senior High School, where he initially played as a linebacker, but became a full-time running back in his junior and senior years. He was Mission Bay's featured running back those years, and led San Diego County in all-purpose yards with 2,500 while compiling 2,093 rushing yards and 24 touchdowns in addition to six scores on kickoff returns his senior year. In a game against Clairemont, Foster ran for 321 yards and for his efforts, he was named San Diego Union Tribune All-San Diego Western League Player of the Year, received All-West Region appointment by PrepStar, and also earned All-California Interscholastic Federation honors. Then-Tennessee offensive coordinator Randy Sanders and running backs coach Trooper Taylor were impressed by Foster when recruiting in San Diego. Foster chose to attend Tennessee and was part of the 2004 signing class. Foster also competed on the track & field team as a sprinter and high jumper. He had personal-bests of 11.24 seconds in the dash, and had a top-jump of (6-2.5) in the high jump. He was also a member of the 4 × 100 m relay squad. Foster red-shirted his first season as a Tennessee Volunteer, sitting behind Gerald Riggs Jr. and Cedric Houston on the depth chart. He was a three-year starter at running back for Tennessee. In his 2005 freshman season, Foster earned the starting job following an injury to Riggs. On October 1, in a home game against the Ole Miss Rebels, he had his first collegiate touchdown. On October 29, in a home game against the South Carolina Gamecocks, he had 148 rushing yards and a rushing touchdown. On November 5, in a road game against the Notre Dame Fighting Irish, he had 125 rushing yards and a rushing touchdown. In the following game against the Memphis Tigers, he had 132 rushing yards in the home victory. In the next game, he had a commanding performance in a loss against the Vanderbilt Commodores. He scored two touchdowns in the game and his total of 268 all-purpose yards was the third-highest total in school history. In the regular season finale in a road game against the Kentucky Wildcats, he had 114 rushing yards and 44 receiving yards. Overall, in the 2005 season, he finished with 879 rushing yards, five rushing touchdowns, 14 receptions, and 148 receiving yards. Foster's sophomore season saw a slight downturn in production. He started the 2006 season with 69 rushing yards and a four-yard receiving touchdown in the home victory over the California Golden Bears. Foster was limited for the majority of the season with injuries and missed games against the Marshall Thundering Herd and the Memphis Tigers. On October 7, in a road game against the Georgia Bulldogs, he had 63 rushing yards and three rushing touchdowns. Splitting time with LaMarcus Coker after returning from injury, Foster ended the season with just 322 rushing yards. Tennessee's final game of the season was the 2007 Outback Bowl against the Penn State Nittany Lions, in which Foster fumbled with ten minutes remaining deep in Penn State territory. The ball was picked up by cornerback Tony Davis and returned 88 yards for a touchdown, breaking a 10–10 tie and providing the winning points in Penn State's 20–10 victory. His junior season saw Foster take over as the main back, with Montario Hardesty coming in as a substitute. In the second game, against the Southern Miss Golden Eagles, he had 125 rushing yards and two rushing touchdowns in the home victory. Against the Florida Gators at the Swamp, Foster fumbled a left-handed hand-off from injured quarterback Erik Ainge which was recovered by Gators linebacker Dustin Doe and returned eighteen yards for a touchdown. Up to that point, Tennessee had been gaining momentum and pulled to within eight points of tying the game, but the botched play made the score 35–20 and triggered a 24-point Florida run to close out the contest. On October 6, at home against the Georgia Bulldogs, he had 98 rushing yards and three rushing touchdowns. In the following game, against the Mississippi State Bulldogs, he had 139 rushing yards and a touchdown. In the annual rivalry game against the Alabama Crimson Tide at Bryant-Denny Stadium, he had 91 rushing yards and a rushing touchdown to go along with four receptions for 74 receiving yards. On October 27, at home against the South Carolina Gamecocks, he had 75 rushing yards and a rushing touchdown. On November 3, at home against the Louisiana–Lafayette Ragin' Cajuns, he had 100 rushing yards and two rushing touchdowns. In the next game, against the Arkansas Razorbacks, he had 83 rushing yards and a rushing touchdown, his seventh consecutive game with a rushing touchdown. Foster surpassed the 1,000-yard mark with a 118-yard performance in a 52–50 win on the road against the Kentucky Wildcats, and finished his junior season with 245 carries for 1,193 yards and 12 touchdowns, while also catching 39 passes for 340 yards and an additional two scores. Foster's breakout junior season resulted in a second-round grade from the draft advisory board and led him to consider leaving school. However, head coach Phillip Fulmer persuaded him to stay for his senior season, a decision Foster would later deeply regret. Playing under the third position coach and offensive coordinator of his tenure, Foster was utilized in a rotation following the installation of a new offensive scheme that the Tennessee coaches thought was a better fit for some of the other running backs on the roster. He only had one game with 100 rushing yards, the second game of the season against the UAB Blazers. For his part, Fulmer would attribute Foster's diminished workload to knee and thigh injuries which would later be disputed. In the end, Foster compiled 849 yards on 191 carries with five touchdowns in his senior season. Foster's subpar senior campaign caused his draft stock to plummet, as well as scouts' concerns about his below-average pass-blocking, issues with ball security, character issues (partly due to his earlier arrest) and the less-than-stellar reviews from Tennessee staff members that portrayed him as selfish and hard to coach. A pulled hamstring also prevented Foster from working out at the NFL Scouting Combine, then he had a poor showing at Tennessee's Pro Day when he registered a 4.65 40-yard dash, 4.50 short shuttle, vertical leap and 9′7″ broad jump. The combination of factors led to Foster being undrafted at the 2009 NFL Draft; after several teams showed interest in him as a rookie free agent, he chose to sign a contract with the Houston Texans in May 2009 because he thought the situation suited him. Foster finished his collegiate career as the school's second all-time leading rusher with 3,338 yards. His legacy, however, was mixed. He fumbled just five times on a school-record 650 carries, but all of his drops came at critical moments, including fumbles in both 2006 Penn State games, one against Florida in 2007, and one against UCLA and Auburn in 2008. His former coach Fulmer has defended Foster regarding these crucial mistakes, saying "There were a couple of fumbles that were untimely that people want to remember; they forget about his full career, about how special he was. He had a couple of fumbles after a couple of big runs. They were costly, but we probably wouldn't have been there without him." Foster ranked 24th among running backs available in the 2009 NFL Draft, according to Sports Illustrated. Although he was projected as a fifth-to-sixth round pick, Foster went undrafted. Foster was signed by the Houston Texans as an undrafted free agent on May 1, 2009. He was later released by the team on September 5, 2009, but then was signed to the Texans' practice squad on September 6 and signed to the active roster on November 17. Foster made his NFL debut against the Tennessee Titans on November 23, 2009 and played on special teams. He scored his first NFL career touchdown against the Miami Dolphins in Miami on December 27, 2009 on a 17-yard run up the middle in the second quarter of the game. Foster then made his first career start against the New England Patriots on January 3, 2010 and ran for 119 yards and scored twice on 20 carries. Overall, Foster played six games, starting one, during the 2009 season, finishing with 257 yards and three touchdowns. A Dallas Cowboys defender pushes Foster down in a 2010 game. Before the 2010 season, Foster changed his number from #37 to #23. In the 2010 season opener on September 12, Houston played against the Indianapolis Colts. Foster replaced Steve Slaton, the starting running back in the 2009 season, and broke many franchise records, rushing 33 times for 231 yards and three touchdowns. In addition to breaking the record for the most rushing yards by a player of the[Houston Texans in a single game, he and Slaton combined for 260 rushing yards, well over the team record for most total in a game, and also the most rushing yards given up to a single player by the Indianapolis Colts. Foster also posted the second-highest NFL opening day rushing total, trailing only O.J. Simpson's 250 yards in 1973. In Week 4, against the Oakland Raiders after being benched for the 1st quarter, Foster recorded the longest run in Texans franchise history when he scored on a 74-yard touchdown run in the third quarter to break a 14–14 tie. Houston went on to win 31–24 behind Foster's 187 yards from scrimmage. After being passed up in rushing yards by Jamaal Charles during the Kansas City Chiefs' last game of the regular season, Foster posted another stunning performance rushing for 180 yards and two touchdowns against the Jacksonville Jaguars to solidify his spot as the 2010 rushing leader. Foster finished the 2010 season by winning the rushing title with 1,616 rushing yards and 604 receiving yards breaking the record set by Priest Holmes for most yards from scrimmage ever by an undrafted player. He was invited to the 2011 Pro Bowl, which was his first Pro Bowl. Foster strained his hamstring twice during the 2011 preseason – at one point creating controversy due to his tweeting of an MRI image of the damaged tendon – resulting in his missing the Texans' season opener against the Indianapolis Colts. Foster returned in Week 2 against the Miami Dolphins, but after carrying the ball ten times for 33 rushing yards in the first half, he missed the remainder of the game due to a re-aggravation of his hamstring. Foster missed Houston's Week 3 game on the road against the New Orleans Saints, but returned to face the Pittsburgh Steelers the following Sunday. Against Pittsburgh, Foster ran the ball 30 times for 155 yards, including a 42-yard fourth-quarter touchdown run that proved to be the winning points in the Texans' 17–10 victory. In what was his tenth career 100-yard game, Foster's total of 155 yards was the second-most by a running back against the Steelers defense since 2001, and the most since Curtis Martin tallied 174 versus Pittsburgh in December 2003. Additionally, his 42-yard touchdown was the longest scoring run allowed by the Steelers since 2006. The Texans squared off with the Oakland Raiders at home in Week 5, just a day after legendary Raiders owner Al Davis died. Foster had a tough time generating yards on the ground, tallying just 68 yards on 22 carries. It was as a pass-catcher that Foster shone against Oakland, catching just five passes for 116 yards, including a career-long 60-yard reception in the third quarter. A last-minute rally by Houston fell short when quarterback Matt Schaub was intercepted in the end zone as Houston fell, 25–20. In Week 6, the Baltimore Ravens' stout defense proved a challenge for Foster as he was limited to just 49 yards on 15 carries in a decisive 29–14 loss. Foster continued to contribute in the passing game, however, catching six passes for 52 yards in the losing effort. Foster exploded in Week 7 against the Tennessee Titans, rushing for 115 yards and two touchdowns on 25 carries while accumulating 119 yards receiving and another touchdown on five catches. This helped the Texans en route to a 41–7 victory over their division foe and established them as the division leader; Foster's 234 total yards fell just short of his personal best of 238, which he registered on Opening Day of the 2010 season versus Indianapolis. Foster followed up his career-day against the Titans with a solid performance against the Jacksonville Jaguars. In a tough, ball-control type of game, Foster equaled his career-high in rushing attempts with 33, totaling 112 yards on the ground. In a nod to Foster's prolific pass-catching in recent weeks, the Jaguars limited Foster to just one catch for 12 yards out of the backfield in Houston's 24–14 victory. On December 22, he had 158 rushing yards and a rushing touchdown against the Indianapolis Colts. He was invited to the 2012 Pro Bowl, which was his second Pro Bowl invite. The Texans finished the season with a 10–6 record and won the AFC South. In the Wild Card Round against the Cincinnati Bengals, he had 153 rushing yards, two rushing touchdowns, three receptions, and 29 receiving yards in the 31–10 victory. In the Divisional Round against the Baltimore Ravens, he had 132 rushing yards, one rushing touchdown, five receptions, and 22 receiving yards in the 20–13 loss. On March 5, the Texans reportedly reached a deal with Foster, deciding he was worth up to $43.5 million over 5 years. The contract included $20.75 million guaranteed, $30 million in his first three years, and $18 million in 2012. In Week 2, Foster had 110 rushing yards and a touchdown against the Jacksonville Jaguars. On October 8, in a Monday Night Football game against the New York Jets, Foster reached 5,000 yards from scrimmage (rushing yards+receiving yards) in his 40th game, becoming the third-fastest player to reach 5,000 yards to do so, only behind Edgerrin James (36 games) and Eric Dickerson (39 games). In his next two games, he recorded two rushing touchdowns in both games against the Green Bay Packers and the Baltimore Ravens. On November 22, against the Detroit Lions, he had 102 rushing yards and two rushing touchdowns. On December 16, against the Indianapolis Colts, he had 165 rushing yards. On December 23 against the Minnesota Vikings, Foster left the game in the third quarter with an irregular heartbeat. Foster was announced the starting running back in the AFC Division for the 2013 Pro Bowl. This was the third Pro Bowl nomination of his careere. He ended the season with league-high 351 carries and 15 rushing touchdowns, and earning him eighth on NFL Top 100 Players of 2013, rising from 25 the previous season. The Texans finished the season with a 12–4 record and won the AFC South for the second consecutive year. In the Wild Card Round against the Cincinnati Bengals, he had 140 rushing yards, one rushing touchdown, eight receptions, and 34 receiving yards. In the Divisional Round against the New England Patriots, he had 90 rushing yards, one rushing touchdown, seven receptions, 63 receiving yards, and one receiving touchdown in the 41–28 loss. Foster sustained a back injury in August before the 2013 regular season began, which limited his preseason play, although he was able to play in the first eight weeks of the regular season. Foster was not physically able to complete the season, but during the time that which he played, Foster had 121 carries, advancing the ball for a total of 542 yards, and had a touchdown in their second game of the regular season in which they defeated the Tennessee Titans. He left the game in Week 7 against the Kansas City Chiefs due to a calf injury. In Week 9, he had to leave the game they lost to the Indianapolis Colts with a season ending back injury. The injury would require surgery for a ruptured disk in Foster's lumbar spine. Foster had surgery on a bulging disk in his back on November 13, 2013, in Los Angeles. Foster tried to play through the injury in the second divisional game against the Indianapolis Colts, the day he injured his back, and then tried to avoid surgery, but, after speaking with multiple doctors and specialists, Dr. Watkins included, he decided to undergo surgery. Foster made it his goal after this devastating injury and surgery to enter the 2014 season as a healthy contributor to the Texans. In the 2014 season opener, a 17–6 win over the Washington Redskins, Foster had 103 rushing yards. In the following game against the Oakland Raiders, he had 138 rushing yards and a rushing touchdown. On October 5, against the Dallas Cowboys, he had 157 rushing yards and two rushing touchdowns. In the next game, against the Indianapolis Colts, he had 109 rushing yards and two rushing touchdowns. He had 102 rushing yards in the following game against the Pittsburgh Steelers. He recorded his fourth consecutive 100-yard game with 151 rushing yards and two rushing touchdowns against the Tennessee Titans. In addition, he had a receiving touchdown in the 30–16 victory over the Titans. On December 7, against the Jacksonville Jaguars, he had 127 rushing yards and a rushing touchdown. Foster had a solid comeback season after returning from his back injury, rushing for 1,246 yards and eight touchdowns while having 38 receptions for 327 receiving yards and five receiving touchdowns. For the fourth season in his career, Foster rushed for at least 1,000 yards. With that accomplishment, Foster was voted to the 2015 Pro Bowl, his fourth such nomination in his NFL career. He was named the FedEx Ground NFL Player of the Week for his Week 8 performance (151 rushing yards and two touchdowns) against the Tennessee Titans. Foster started the 2015 season injured and did not play until Week 4 against the Atlanta Falcons. In the next game, against the Indianapolis Colts, he had 41 rushing yards, nine receptions, and 77 receiving yards. In the following game, he had his first touchdown of the season against the Jacksonville Jaguars. Foster ruptured his Achilles tendon on October 25, 2015, in a Week 7 loss to the Miami Dolphins. Before exiting, he had 59 rushing yards, one rushing touchdown, five receptions, 66 receiving yards, and one receiving touchdown in the game. Two days later, Foster was placed on injured reserve, effectively ending his season. Foster was released by the Texans on March 3, 2016. He finished his Texans career with 6,472 yards and 54 rushing touchdowns, both franchise records. On July 18, 2016, Foster signed a one-year contract with the Miami Dolphins. Foster wore #34 during the preseason, but would later change it to #29 before the regular season started. He rushed for 55 yards in four games before suffering another lower body injury. On October 24, 2016, one day after rushing for five yards on three carries against the Buffalo Bills, Foster announced his retirement from the NFL. From a young age, Foster expressed a creative interest in activities outside sports, such as poetry in elementary school, and improvisation and theater in high school. Foster first appeared on television as an actor, and not an athlete, as a guest star of the show Hawaii Five-0 in an episode that takes place during the Pro Bowl. He played himself, aiding Danno and McGarrett as they solved the murder of a tech executive, while Foster was in town for the game. After getting injured in the 2013 season, Foster joined the cast of the movie Draft Day, to play a running back getting drafted into the NFL. The film came out in April 2014. Foster has not ruled out the possibility of partaking in an acting job once again if it does not interrupt his career as an athlete in any way. In an interview on the subject he stated, "I thoroughly enjoyed my experiences in the film industry thus far. So I don't see why, if an opportunity presents itself again, I wouldn't jump on it, but it won't get in the way of my football career because that's first and foremost. That was my dream since I was seven years old." In 2015, Foster was one of the narrators for the documentary film Unity. On March 8, 2017, Foster appeared on Joe Rogan's podcast the Joe Rogan Experience #928. He responded to comments he made on Twitter about being able to kill a wolf, and discussed his interest in physics, astronomy, artistic endeavors, and his uncensored take on the NCAA and the NFL. Foster also made a guest appearance on the YouTube podcast Painkiller Already (PKA) during which he gave his opinions on the NFL's battle with CTE and continued with his ideas on killing a wolf. He also told his struggles with dealing with instantaneous fame of college football. Foster started his own podcast, Now What? with Arian Foster, in fall 2017. The podcast (also available on YouTube) features Foster conversing with guests on a wide range of topics "from current events to unexplored regions of our universe." In 2018, Foster appeared on the MTV series The Challenge: Champs vs. Stars as a contestant raising money for his charity the Arian Foster Foundation. On April 26, 2018, Foster released his debut rap album Flamingo & Koval under the stage name Bobby Feeno on Tidal. The album was recorded under LeBron James record label Uninterrupted. His introduction into the music industry was documented in the docuseries Becoming Bobby Feeno which was produced by Foster, James, Maverick Carter, and Humble Lukanga. As was documented on ESPN's Sunday NFL Countdown, Foster was a philosophy major at the University of Tennessee and is an avid writer of poetry. His first name is an abbreviated form of Aquarian, which means "water bearer", or, according to his father, "holder of knowledge". His father is black and his mother is of Mexican descent. Sporting News called Foster "the most interesting man in the NFL". He became a vegan in July 2012. Though this did not last very long, his diet was a very interesting subject to the media for a period of time. Regarding his diet, he said: "I just like to eat healthy, man. That whole vegan thing, a lot of people are really interested in my food... I've had meat since I've said I don't eat meat anymore. I like to stay with the plant-based foods, but every now and then, I'll eat meat." Foster revealed his political affiliation during an NFL game, stating he is "in the Green Party", and he voted for Ron Paul, who ran as a Republican in the 2012 Presidential election. Foster was raised as a Muslim, but has since renounced religion and now identifies as an atheist, although he believes in reincarnation. ^ McCurdy, Jim. "McCurdy: Arian Foster bows to show respect". ESPN.com. Retrieved November 5, 2018. ^ Wesseling, Chris (2016). "Dolphins' Arian Foster announces his NFL retirement". NFL.com. Retrieved October 24, 2016. ^ Farmer, Sam (September 17, 2010). "Texans' Arian Foster followed his dream: Undrafted running back had spectacular debut with Texans". Austin American-Statesman. Archived from the original on December 18, 2010. Retrieved September 21, 2010. ^ Farmer, Sam (September 15, 2010). "Texans' Arian Foster has always been confident in his abilities". Los Angeles Times. Retrieved January 13, 2013. ^ Legwold, Jeff. "Some fatherly advice kept Texans RB Arian Foster on track to NFL". Denver Post. Retrieved August 8, 2015. ^ "JockBio: Arian Foster Biography". jockbio.com. Retrieved August 8, 2015. ^ a b "Arian Foster". University of Tennessee Football. Archived from the original on October 7, 2011. Retrieved October 7, 2011. ^ "Arian Foster - Rivals.com". Rivals.com. Retrieved February 16, 2018. ^ "Arian Foster". trackingfootball.com. Retrieved August 8, 2015. ^ "Foster Duo Named to SEC Coaches' All-Freshman Squad". University of Tennessee Athletics. December 8, 2005. Retrieved November 5, 2018. ^ "Arian Foster College Stats". College Football at Sports-Reference.com. Retrieved February 16, 2018. ^ "Ole Miss at Tennessee Box Score, October 1, 2005". College Football at Sports-Reference.com. Retrieved February 16, 2018. ^ "South Carolina at Tennessee Box Score, October 29, 2005". College Football at Sports-Reference.com. Retrieved February 16, 2018. ^ "Tennessee at Notre Dame Box Score, November 5, 2005". College Football at Sports-Reference.com. Retrieved March 19, 2019. ^ "Memphis at Tennessee Box Score, November 12, 2005". College Football at Sports-Reference.com. Retrieved February 16, 2018. ^ "Tennessee at Kentucky Box Score, November 26, 2005". College Football at Sports-Reference.com. Retrieved February 16, 2018. ^ "Arian Foster 2005 Game Log". College Football at Sports-Reference.com. Retrieved February 16, 2018. ^ "California at Tennessee Box Score, September 2, 2006". College Football at Sports-Reference.com. Retrieved February 16, 2018. ^ "Tennessee at Georgia Box Score, October 7, 2006". College Football at Sports-Reference.com. Retrieved February 16, 2018. ^ "Arian Foster 2006 Game Log". College Football at Sports-Reference.com. Retrieved February 16, 2018. ^ "Southern Mississippi at Tennessee Box Score, September 8, 2007". College Football at Sports-Reference.com. Retrieved February 16, 2018. ^ "Tennessee at Florida Box Score, September 15, 2007". College Football at Sports-Reference.com. Retrieved February 16, 2018. ^ "Georgia at Tennessee Box Score, October 6, 2007". College Football at Sports-Reference.com. Retrieved February 16, 2018. ^ "Tennessee at Mississippi State Box Score, October 13, 2007". College Football at Sports-Reference.com. Retrieved February 16, 2018. ^ "Tennessee at Alabama Box Score, October 20, 2007". College Football at Sports-Reference.com. Retrieved February 16, 2018. ^ "South Carolina at Tennessee Box Score, October 27, 2007". College Football at Sports-Reference.com. Retrieved February 16, 2018. ^ "Louisiana-Lafayette at Tennessee Box Score, November 3, 2007". College Football at Sports-Reference.com. Retrieved February 16, 2018. 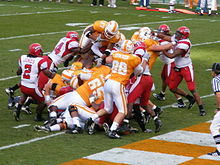 ^ "Arkansas at Tennessee Box Score, November 10, 2007". College Football at Sports-Reference.com. Retrieved February 16, 2018. ^ "Tennessee at Kentucky Box Score, November 24, 2007". College Football at Sports-Reference.com. Retrieved February 16, 2018. ^ "Arian Foster 2007 Game Log". College Football at Sports-Reference.com. Retrieved February 16, 2018. ^ "Vols' Foster to return for senior season". ESPN. January 15, 2008. Archived from the original on October 7, 2011. Retrieved October 7, 2011. ^ a b Shipley, Amy (September 19, 2010). "Texans' Foster is yards from ordinary". The Washington Post. Retrieved August 31, 2011. ^ "UAB at Tennessee Box Score, September 13, 2008". College Football at Sports-Reference.com. Retrieved February 16, 2018. ^ "Arian Foster 2008 Game Log". College Football at Sports-Reference.com. Retrieved February 16, 2018. ^ "View Draft by Positions". CNN. ^ "Tennessee Titans at Houston Texans - November 23rd, 2009". Pro-Football-Reference.com. Retrieved February 16, 2018. ^ "USA Today: Texans vs. Dolphins Box Score". USA Today. Retrieved August 25, 2011. ^ "Houston Texans: Arian Foster". nfl.com. Retrieved August 8, 2015. ^ "Arian Foster 2009 Game Log". Pro-Football-Reference.com. Retrieved February 16, 2018. ^ "Arian Foster". NFL.com. Retrieved August 8, 2015. ^ "Watch Indianapolis Colts vs. Houston Texans [09/12/2010] - NFL.com". nfl.com. Retrieved August 8, 2015. ^ "Most Rushing Yards In NFL Openers". SI.com. Retrieved February 16, 2018. ^ "Houston Texans at Oakland Raiders - October 3rd, 2010". Pro-Football-Reference.com. Retrieved February 16, 2018. ^ "Jacksonville Jaguars at Houston Texans - January 2nd, 2011". Pro-Football-Reference.com. Retrieved February 16, 2018. ^ "2010 NFL Rushing & Receiving". Pro-Football-Reference.com. Retrieved February 16, 2018. ^ "Arian Foster 2010 Game Log". Pro-Football-Reference.com. Retrieved February 16, 2018. ^ "2010 NFL Pro Bowlers". Pro-Football-Reference.com. Retrieved March 19, 2019. ^ "Arian Foster tweets MRI of hamstring, gets instant diagnosis". Shutdown Corner (Yahoo Sports). August 31, 2011. Archived from the original on October 7, 2011. Retrieved October 7, 2011. ^ "Arian Foster inactive along with Peyton Manning". USA Today. September 11, 2011. Archived from the original on September 16, 2011. Retrieved September 15, 2011. ^ "Arian Foster reinjures hamstring". Pro Football Talk. September 18, 2011. Archived from the original on October 7, 2011. Retrieved October 7, 2011. ^ a b "Texans-Steelers postgame notes". Houston Texans- Blog. October 2, 2011. Archived from the original on October 7, 2011. Retrieved October 7, 2011. ^ "Oakland Raiders at Houston Texans - October 9th, 2011". Pro-Football-Reference.com. Retrieved February 16, 2018. ^ "Houston Texans at Baltimore Ravens - October 16th, 2011". Pro-Football-Reference.com. Retrieved February 16, 2018. ^ "Houston Texans at Tennessee Titans - October 23rd, 2011". Pro-Football-Reference.com. Retrieved February 16, 2018. ^ "Jacksonville Jaguars at Houston Texans - October 30th, 2011". Pro-Football-Reference.com. Retrieved February 16, 2018. ^ "Houston Texans at Indianapolis Colts - December 22nd, 2011". Pro-Football-Reference.com. Retrieved February 16, 2018. ^ Foster, Joseph earn 2012 Pro Bowl invitations, Houston Texans, December 27, 2011. ^ "2011 Houston Texans Statistics & Players". Pro-Football-Reference.com. Retrieved February 16, 2018. ^ "Wild Card - Cincinnati Bengals at Houston Texans - January 7th, 2012". Pro-Football-Reference.com. Retrieved February 16, 2018. ^ "Divisional Round - Houston Texans at Baltimore Ravens - January 15th, 2012". Pro-Football-Reference.com. Retrieved February 16, 2018. ^ "Arian Foster signs five-year deal". ESPN.com. March 7, 2012. Retrieved January 9, 2016. ^ La Confora, Jason. "Arian Foster joins AP and CJ atop RB $$ ranks". Twitter. Twitter. Retrieved March 6, 2019. ^ "Houston Texans at Jacksonville Jaguars - September 16th, 2012". Pro-Football-Reference.com. Retrieved February 16, 2018. ^ Arian Foster third Fastest to 5,000 yards, lifts Texans past Jets, Knox News, October 9, 2012. ^ "Green Bay Packers at Houston Texans - October 14th, 2012". Pro-Football-Reference.com. Retrieved February 16, 2018. ^ "Baltimore Ravens at Houston Texans - October 21st, 2012". Pro-Football-Reference.com. Retrieved February 16, 2018. ^ "Houston Texans at Detroit Lions - November 22nd, 2012". Pro-Football-Reference.com. Retrieved February 16, 2018. ^ "Indianapolis Colts at Houston Texans - December 16th, 2012". Pro-Football-Reference.com. Retrieved February 16, 2018. ^ Adelson, Eric (December 23, 2012). "Arian Foster health scare, missing offense lead to boos, questions for Texans". Yahoo! Sports. Retrieved December 23, 2012. ^ "Top 100 Players of 2013 - NFL.com". NFL.com. Retrieved August 8, 2015. ^ "Arian Foster 2012 Game Log". Pro-Football-Reference.com. Retrieved February 16, 2018. ^ "2012 Houston Texans Statistics & Players". Pro-Football-Reference.com. Retrieved February 16, 2018. ^ "Wild Card - Cincinnati Bengals at Houston Texans - January 5th, 2013". Pro-Football-Reference.com. Retrieved February 16, 2018. ^ "Divisional Round - Houston Texans at New England Patriots - January 13th, 2013". Pro-Football-Reference.com. Retrieved February 16, 2018. ^ "Tennessee Titans at Houston Texans - September 15th, 2013". Pro-Football-Reference.com. Retrieved February 16, 2018. ^ "Houston Texans at Kansas City Chiefs - October 20th, 2013". Pro-Football-Reference.com. Retrieved February 16, 2018. ^ "Texans' Foster Leaves Game Against Chiefs With Hamstring Injury". CBS DFW. October 20, 2013. Retrieved February 16, 2018. ^ "Report: Arian Foster done for 2013 with back injury". houstontexans.com. Retrieved August 8, 2015. ^ Tom Pelissero, USA TODAY Sports (November 10, 2013). "Texans' Arian Foster to undergo season-ending back surgery". USA TODAY. Retrieved August 8, 2015. ^ "Arian Foster 2013 Game Log". Retrieved February 16, 2018. ^ Jim Corbett, USA TODAY Sports (November 27, 2013). "Texans RB Arian Foster undergoes back surgery". USA TODAY. Retrieved August 8, 2015. ^ "Back surgery for Arian Foster of Houston Texans". ESPN.com. Retrieved August 8, 2015. ^ Smith, R. Cory. "Arian Foster Injury: Updates on Texans RB's Recovery from Back Surgery". Bleacher Report. Retrieved August 8, 2015. ^ "Washington Redskins at Houston Texans - September 7th, 2014". Pro-Football-Reference.com. Retrieved February 16, 2018. ^ "Houston Texans at Oakland Raiders - September 14th, 2014". Pro-Football-Reference.com. Retrieved February 16, 2018. ^ "Houston Texans at Dallas Cowboys - October 5th, 2014". Pro-Football-Reference.com. Retrieved February 16, 2018. ^ "Indianapolis Colts at Houston Texans - October 9th, 2014". Pro-Football-Reference.com. Retrieved February 16, 2018. ^ "Houston Texans at Pittsburgh Steelers - October 20th, 2014". Pro-Football-Reference.com. Retrieved February 16, 2018. ^ "Houston Texans at Tennessee Titans - October 26th, 2014". Pro-Football-Reference.com. Retrieved February 16, 2018. ^ "Houston Texans at Jacksonville Jaguars - December 7th, 2014". Pro-Football-Reference.com. Retrieved February 16, 2018. ^ "Arian Foster 2014 Game Log". Pro-Football-Reference.com. Retrieved February 16, 2018. ^ "Houston Texans at Atlanta Falcons - October 4th, 2015". Pro-Football-Reference.com. Retrieved February 16, 2018. ^ "Indianapolis Colts at Houston Texans - October 8th, 2015". Pro-Football-Reference.com. Retrieved February 16, 2018. ^ "Houston Texans at Jacksonville Jaguars - October 18th, 2015". Pro-Football-Reference.com. Retrieved February 16, 2018. ^ "Houston Texans at Miami Dolphins - October 25th, 2015". Pro-Football-Reference.com. Retrieved February 16, 2018. ^ Bergman, Jeremy (October 25, 2015). "Texans' Arian Foster out for season with torn Achilles". NFL.com. Retrieved January 9, 2016. ^ Orr, Conor (March 3, 2016). "Houston Texans release veteran RB Arian Foster". NFL.com. Retrieved March 3, 2016. ^ Sanchez, Mark (March 3, 2016). "Arian Foster and the NFL divorces we never thought we'd see". New York Post. Retrieved March 3, 2016. ^ "Arian Foster signs deal with Miami". ESPN. Retrieved July 18, 2016. ^ "Arian Foster 2016 Game Log". Pro-Football-Reference.com. Retrieved February 16, 2018. ^ "Buffalo Bills at Miami Dolphins - October 23rd, 2016". Pro-Football-Reference.com. Retrieved February 16, 2018. ^ Wesseling, Chris (October 24, 2016). "Dolphins' Arian Foster announces his NFL retirement". NFL.com. Retrieved October 24, 2016. ^ "Houston Texans Career Rushing Leaders". Pro-Football-Reference.com. Retrieved November 5, 2018. ^ "Houston Texans Single-Season Rushing Leaders". Pro-Football-Reference.com. Retrieved November 5, 2018. ^ "Arian Foster — Biography". jockbio.com. ^ a b "Arian Foster's Draft Day makes debut in Houston". houstontexans.com. Retrieved August 8, 2015. ^ Strauss, Chris (February 14, 2013). "Arian Foster helps Danno 'book 'em' on 'Hawaii Five-O'". USA TODAY. Retrieved August 8, 2015. ^ "A Minute With: Football's Arian Foster on acting and NFL draft". Yahoo Sports. April 12, 2014. Retrieved August 8, 2015. ^ Rogan, Joe (March 9, 2017). "Joe Rogan Experience #928". JoeRogan.net. ^ Rogan, Joe (March 9, 2017). "JRE #928". YouTube. ^ Rogan, Joe (March 9, 2017). "Joe Rogan Experience Podcast #928". libsyn.com. ^ "PKA 370 Arian Foster - Attacking Wings, Arian Smacks Fan, Goat Loved to Death". January 20, 2018. ^ Foster, Arian. "Now What?". Twitter. ^ Foster, Arian. "Now What?". YouTube. ^ "Now What? with Arian Foster". Soundcloud. Retrieved March 10, 2018. ^ Longeretta, Emily (March 29, 2018). "'The Challenge: Champs vs. Stars' 2018 Cast and Promo Revealed". Us Weekly. Retrieved November 19, 2018. ^ "Ex-NFL Star Arian Foster Teams With Tidal & LeBron James To Launch Music Career". AllHipHop.com. 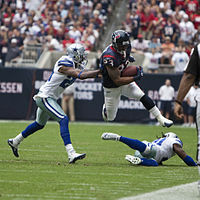 ^ "Houston Texans' Arian Foster makes his own way -- E:60". ESPN.com. Retrieved August 8, 2015. ^ "Arian Foster makes his own way", ESPN.com, October 16, 2011. ^ "Arian Foster no longer on a strictly vegan diet". houstontexans.com. Retrieved August 8, 2015. ^ "Cincinnati at Houston". NFL Sound FX. January 7, 2012. NFL Network. ^ Keown, Tim (August 6, 2015). "The Confession of Arian Foster". ESPN. Retrieved August 6, 2015. Wikimedia Commons has media related to Arian Foster.